Five local teenagers who were specially selected to compete in the J/80 class as the Helly Hansen Junior Crew finished the fleet’s only race in first place — the first Junior Crew victory since Helly Hansen began sponsoring local teens at each of the series’ five annual stops in 2016. When asked the key to their success, the teens credited a wise tactical call at the beginning of the race, which set the stage for smooth sailing all the way to the finish line. From there, the team was able to catch a breeze on the left side of the course, keep the boat’s weight to leeward and as far forward as possible, and hold onto first through the finish. The crew — completed by skipper Kate Riley, 18; Amelia Johnson, 15; Carter O’Neill, 15; and Chase Conway, 14 — heads into the final day of racing ranked 14th out of 21 boats. The Helly Hansen Junior Crew was awarded the North Sails “Local Boat of the Day” award in celebration of the achievement. Other teams were able to cash in Saturday’s one race for the first-place spot in their fleets’ rankings. Etchells skipper Matt Lalumiere and his team are leading their competitive class by only one point after winning the day two race, despite starting the day in fourth place. Like the Junior Crew, Lalumiere’s team Ca$h Money were able to get ahead of the pack quickly amid challenging conditions. Lalumiere said he’ll make a game plan for Sunday based on what the wind is doing in the moment, but the ultimate goal is to make sure the teams currently in second and third place stay behind his boat. Likewise, Pat FitzGerald and his crew on the J/24 Rush Hour are in a precarious position heading into day three, currently ranked first but tied in points with Spaceman Spiff’s Pete Kassal. His team found that, in contrast to Friday’s focus on the left side of their course, Saturday’s conditions favored the right. 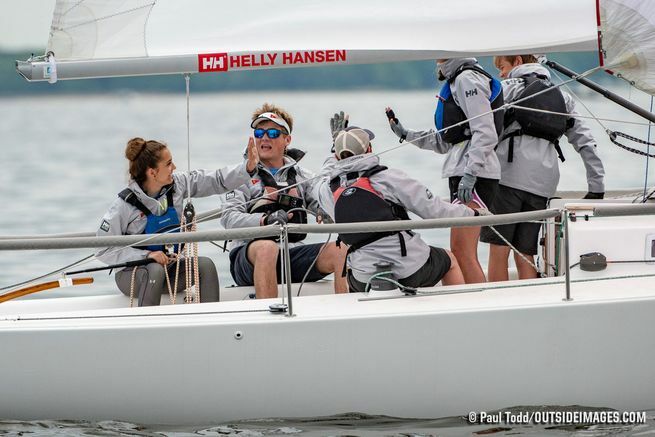 The Helly Hansen National Offshore One Design Regatta in Annapolis continues through May 6.